Organizers of Africa's biggest DJ festival, the annual Ghana DJ Awards, Merqury Republic, wish to announce to all Disc Jockeys and the general public that nominations have been opened for the 2019 edition of the awards. These should be attached to submissions online or enclosed within an envelope addressed to Ghana DJ Awards Nomination, PO Box 2863, Kaneshie, Accra, Ghana. They may be emailed to [email protected] with links to mixtape or performance(s). Besides the categories for which submissions are required, the awards, which is organised by Merqury Republic, bestows an individual or group a Lifetime Achievement Award. "The prestige associated with induction and receipt of the Lifetime Achievement Award is projected to exceptional individuals and/or groups who are recognized as leaders of our industry," says Felicia Bazie, Events Coordinator at Merqury Republic. "Induction is not limited to any one (1) candidate(s) per year. 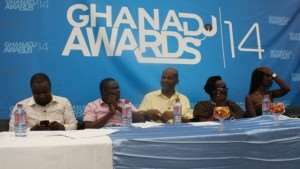 Inductees will receive an official Ghana DJ Award inscribed with their name, and will be recognised with a synopsis of their history and contributions through a formal segment presented by selected peers and colleagues during the Ghana Awards gala."